From the fabric of the global economy to families planning tonight’s dinner, communications networks — and the power grid that underlies them — are woven more tightly through our lives than ever before. But those networks all could be gone in a flash. A geomagnetic storm triggered by a burst of solar energy could overwhelm the nation’s power grid and shut down cell towers and communication networks. Similarly, a human-built electromagnetic pulse (EMP) weapon could temporarily wipe out the networks that connect and sustain us. This would be much worse than a power outage: Along with the lights, information itself would be blacked out. Experts are not taking this lightly. From space-based research about the sun's energy to new efforts that could safeguard power stations against an attack, science is fighting back to keep our connections open. Occasionally, the sun unleashes pent-up energy in the form of a solar flare or a coronal mass ejection (CME), which is a blast of plasma. Satellite data helps scientists predict these solar eruptions, but there are still plenty of questions about how the sun works; answering them would improve forecasts of space weather. Earth’s magnetic field protects us against the sun’s firehose of energy, but sometimes the sun overpowers the planet’s defenses. When that happens, solar radiation heats the upper atmosphere and charges it with electricity, which is what causes auroras at the northern and southern poles. When the coronal mass ejection arrives a day or so later, it interacts with and dramatically changes Earth’s magnetic field, explains Thomas Berger, a solar physicist in Boulder, Colo., home of NOAA’s Space Weather Prediction Center. The atmosphere’s uppermost layer is already warmer, and now it’s battling a cloud of plasma that creates currents in the atmosphere and on the ground. Earth already experienced this worst-case scenario, but nobody alive today was there to see it. The 1859 Carrington Event was a geomagnetic storm triggered by an eruption of charged particles that streamed toward Earth. It was in the early days of telegraphs, well before countries were electrified. But particles from the sun were powerful enough to send a charge through telegraph lines that shocked operators and lit telegraph paper on fire. If this happened now without warning, the results could be catastrophic. Power plants, substations, and transmission lines for entire cities or regions could be fried. People might be without power for days or weeks, leading to food shortages and untold crises. The effects on the economy would also be devastating: Just one day without power in New York City could cost $1 billion, according to a 2013 report from the American Society of Civil Engineers. Across the federal government, at least 27 separate programs are working on ways to prevent this scenario. Power transformers are the backbone of the grid. Some transformers at power stations increase voltage so that it can be transmitted many miles, while others “step down” voltage so it can enter homes at safe levels. Large ones can take months to repair or rebuild, resulting in long-term blackouts, according to the Electric Power Research Group. In an emergency, federal agencies could set up temporary transformers to act as a stopgap, much like FEMA sets up temporary housing after disasters. The Department of Homeland Security has a Recovery Transformer program devoted to designing and building a type of easily deployable transformer that can be installed anywhere in an emergency. And the Department of Energy (DOE) is working on a “strategic transformer reserve” — a supply of extra transformers that can be trucked throughout America if necessary. Equipment to protect large power transformers costs about $350,000 per circuit, according to the Foundation for Resilient Societies. Safeguarding the grid against solar storms and EMPs would cost between $10 billion and $30 billion, the foundation says. Utilities are already working on solutions, says Rob Manning, vice president for transmission at the Electric Power Research Institute. Some are building capacitor banks, which could work like batteries to absorb and dissipate excess energy. Or they can install electricity-dampening devices called Faraday cages, which are like force fields that can surround critical pieces of equipment and protect them from currents. The DOE is also building better flywheels that can spin faster or slower depending on their charge. A flywheel could physically drain excess electricity off the grid, turning the sun’s electrons into movement and heat. Special dampening devices can also drain away or block excess current, but none of these is a perfect solution, Manning says. And even better warning systems are coming. A new sun-orbiting satellite launching in 2018, called the Parker Solar Probe, will study the corona in unprecedented detail, providing new information about how the sun’s atmosphere gets so hot and spits out harmful CMEs. NOAA scientists are also working on a new satellite, unofficially called the Space Weather Follow-On Mission, that would study the sun’s magnetic fields — if it receives federal funding. Down on Earth, scientists are trying to understand the planet’s electrical conductivity, which would help them predict how surges of power from space would spread underground. But the sun isn’t the only source of danger to the grid. An EMP could wreak as much havoc on society as a traditional bomb blast, albeit with less loss of life. The casualties from an EMP would occur as a result of a lack of power, water, and medicine. The most ruinous type of EMP would come in the form of a high-altitude nuclear detonation, where it would create a series of blast waves radiating in all directions, impacting electrical equipment on the ground, in the air, and in orbit. A nuclear weapon detonated in the upper atmosphere over, say, Kansas, could affect the entire continental U.S., according to researchers at the Foundation for Resilient Societies. 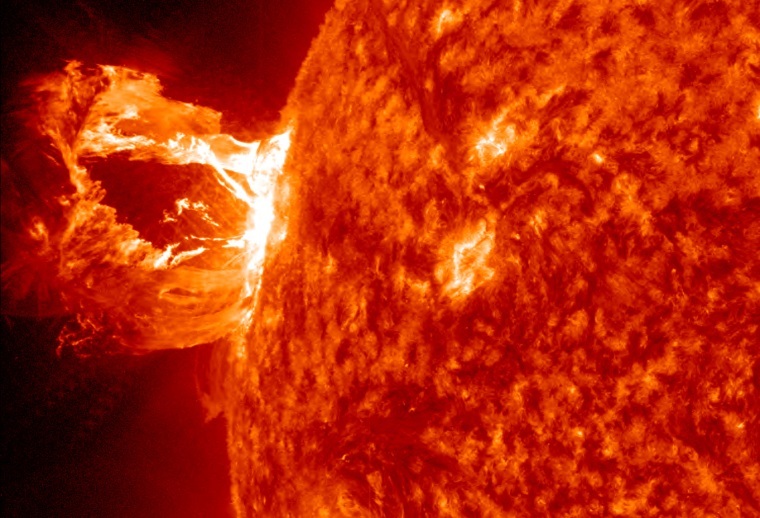 Just like a solar storm, an EMP would send raging currents into the electrical grid, frying transformers, circuit breakers, and substations. But scientists aren’t exactly sure what would happen to the vast range of devices on the grid, from cell towers to smartphones, Manning says. Part of the challenge is understanding how transformers and circuit breakers would respond to the heat and high voltages of an EMP. If they’re exposed to extreme heat for just an instant, they might be fine, much the same way that people can quickly walk across hot coals without getting burned. But a longer-lasting flash would cause real damage. The Electric Power Research Institute is in the middle of a three-year study exploring these questions. The Department of Energy is also studying possible effects of high-energy EMPs. Odds are an EMP attack would be on a local scale, which means the grid would likely be fine overall, notes Scott Aaronson, senior director of national security policy at the Edison Electric Institute. There's no single point of failure in the country’s electrical system. The grid is somewhat of a misnomer because it’s really hundreds of independently operated utilities, each of which manages resources in its own way. Private industry owns 85 percent of the U.S.'s critical electrical infrastructure. He argues an EMP is less of a concern than everyday problems — from solar storms to Earth generated lightning, to the most mundane threats. “I can promise you, at this very minute there is a squirrel meeting his or her demise by chewing through a power line somewhere,” Aaronson says. Others take a more dystopian view. Thomas Popik, chairman of the Foundation for Resilient Societies, testified last year before the Federal Energy Regulatory Commission that allocating 5 percent of the U.S. defense budget to infrastructure projects would help protect the grid and save lives. “If a densely populated area such as Washington, D.C. lost all electric power, and no outside assistance was available, and people could not evacuate by car because gasoline station pumps were inoperable due to lack of power, and municipal water and sanitation services stopped working, what percent of the population would still be alive after one month?” he questioned. Aaronson argues that this is “a fiction,” and that he finds himself in the middle. “I tend to view this as a threat that we need to prevent from happening in the first place,” he says. To that end, space weather forecasting — and international diplomacy — are our best weapons in the fight to save the grid.